The entertaining central conceit of Charles Dickens first novel, The Pickwick Papers (1836), is that that "immortal gentleman," Mr. Pickwick, an "extraordinary," "colossally minded," "truly great" "man of genius," is in fact a chubby, balding, bespectacled, pleasure-loving, middle-aged man whose good nature and naivete land him in a series of comical scrapes from which not even his streetwise and philosophic servant Sam Weller is always able to extract him unharmed. As a wealthy retired businessman, Mr. Pickwick's only occupation is traveling around England eating and drinking and investigating human nature with his three absurd friends and followers (the ersatz sportsman Mr. Winkle, the so-called poet Mr. Snodgrass, and the aged, rotund wannabe ladies man Mr. Tupman), ostensibly reporting their doings to the Pickwick Club in London, of which Mr. Pickwick is founder and president. As Mr. Pickwick indulges in his hobby of studying the drama of life in different (at first ideally comfortable) settings and guises, as he falls into embarrassing fixes, and as he hears stories from the people with whom he converses, Dickens satirizes sports, reform religion, the legal system, political parties, stock brokers, dismal debtor's prisons, contentious husbands and wives, pretentious literary circles, foolish scholarly associations, and grotesque social pretensions. He also celebrates liberal, big-hearted, good-natured people like Pickwick and his countryside gentleman friend Mr. Wardle, romantic marriages, rustic and hospitable coach inns and simple and solid coachmen, and pleasurable festivals like Christmas. He even at one point includes a Christmas story featuring a Scrooge-like sexton in need of a good supernatural scare. The novel is a picaresque series of set pieces tied together by a few recurring strands, like the ways in which the paths of the adventurer-"stroller"-actor-con-man Mr. Jingle and his servant/friend Job Trotter and of Pickwick and co. repeatedly cross each other, in which the legal suit of Bardell vs. Pickwick increasingly plagues the affable man, and in which Pickwick's disciples inconveniently fall in love. The novel is not a bildungsroman, for the fully mature Mr. Pickwick passes through his experiences largely unchanged. Instead, he acts as a catalyst for other people's changes, and as the novel progresses, especially in the last third, Mr. Pickwick's aspect as (as his servant Sam Weller puts it) an angel in tights and gaiters and spectacles comes to the fore. Sam Weller is a great character: cockney, loyal, brave, strong, wise, and possessed of funny mannerisms: pronunciation of w as v and v as w, comical nicknames for people ("Vere does the mince-pies go, young opium eater?") and hilarious comparisons of present situations to exaggeratedly apt and usually violent prior cases (Wellerisms), as when he says, "Business first, pleasure afterwards, as King Richard the Third said wen he stabbed t'other king in the Tower, afore he smothered the babbies." Or 'Vich I call addin' insult to injury, as the parrot said ven they not only took him from his native land, but made him talk the English langwidge arterwards.' Or "Wery sorry to 'casion any personal inconwenience, ma'am, as the house-breaker said to the old lady when he put her on the fire." David Timson gives an inspired reading of the novel, particularly with supporting characters like Sam Weller, his father, and the sleepy "fat boy" servant Joe. Every word he reads sounds just as Dickens must have intended it to be read. Although he greatly increases the pleasure of the novel, I did think (especially in the early going) that he lays on Dickens' comical cheek a bit thickly as the third person narrator. In The Pickwick Papers appear many flashes of Dickens' particular genius that he fully develops in his later books: inventive, vivid, and rich descriptions; great lines worthy of re-reading and savoring; singular characters marked by human foibles, funny mannerisms, and strange names; imaginative set-pieces that linger in the mind; self-reflexive statements about novel writing; tear-jerking sentimentality; angry social conscience; open-minded view of class and culture; keen vision of human folly, villainy, and kindness; and so on. 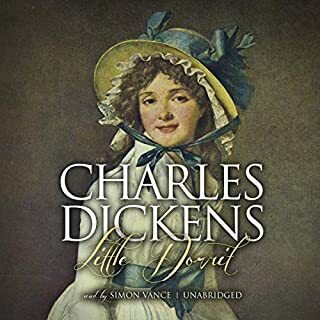 But often I found myself wandering during Dickens' extended riffs or interpolated tales (some of which don't absolutely need to be in the novel), and the overall story is not as compelling as those in his future books. 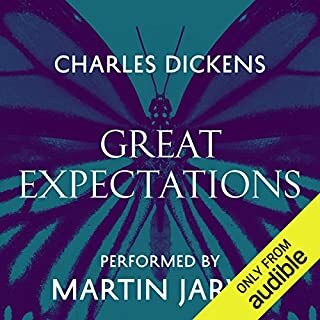 Thus, fans of Charles Dickens should surely read/listen to The Pickwick Papers, but people new to his work should probably start with more classic books like David Copperfield and Great Expectations. Though I always enjoy Dicken's novels, The Pickwick Papers was not an all-time favorite. For the first while I was confused and thought the tale was somewhat pointless. However, David Timson's marvelous narration made every minute of listening worth while. I don't believe I've ever heard a reader so adept at capturing a variety of Dickension characters and moods with precise accuracy and no overdone dramatics. Thanks to Timson, I was able to forgive the first hour or so of confusion and get on with really enjoying this collection of tales that comprise a somewhat plotless novel. Highly entertaining, laugh-out-loud humor, beautiful description, and profound insights that sill apply today. This book morphed a couple times in my brain. 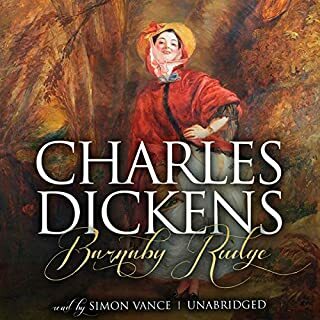 It started off a bit uneven, filled with vignettes and sketches that seemed to anticipate the later genius of Dickens and even presented several shadows of future books and stories. After 100 pages I figured I would have another 700 pages of various Pickwick club digressions. There would be interesting characters (Sam Weller, Alfred Jingle, etc). The narrative started to bog down, however, during the next couple hundred pages. The book had little velocity and the digressions seemed to have stalled, but then something happened. Dickens absolutely found his genius. It is interesting to behold a great author find his voice. I'm not just talking about any author or any voice. It is amazing to see Dickens find that genius balance between characters, plot, social commentary/satire, and humor. It was like watching a bird hatch, a butterfly emerge from its chrysalis. More than the story, which ended very well, the book is worth the effort for what it shows about Dickens. 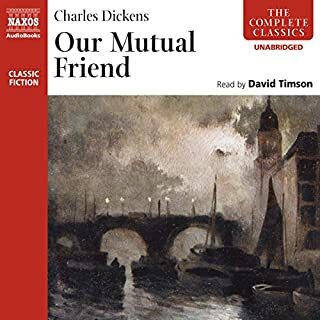 This isn't the first Dickens I'd read, but after you've read a bunch of Dickens, I'd definitely read this just to soak in Dickens growth and his views on friendship, marriage, lawyers, and debt. 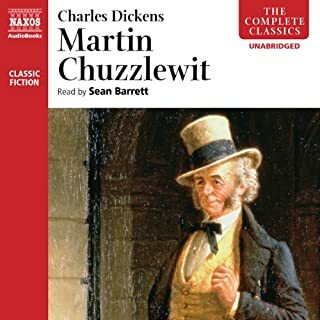 Audible has given me the chance to fall in love with Dickens. 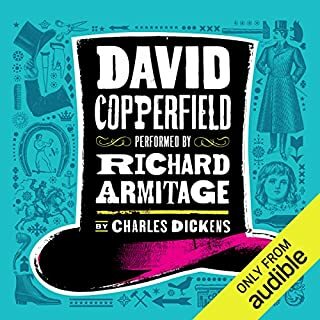 I have now listened to all the great novels, my favorites being Our Mutual Friend and David Copperfield, but I have loved them all. I hesitated to download The Pickwick Papers, fearing that it would be too silly and tarnish my admiration for his wit and wisdom. 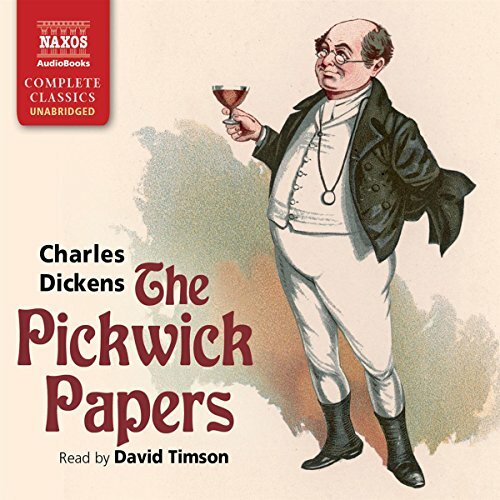 But I didn't have many more Dickens titles left, and I love David Timson as a narrator, so I took a chance. 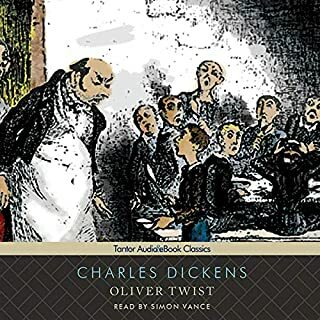 It took me a long time to settle into the book -- indeed there are many silly characters and events and many digressions, and it took a while for Dickens to develop those characters that I always fall in love with -- the truly good people who are kind and generous in a selfish and often grim world. Dickens tries out lots of themes that dominate his later, great, novels -- ghost stories (including a Christmas tale), debtor's prison, the legal profession (scoundrels almost all), alcoholism, tight-fisted businessmen who treat their progeny badly, political battles, the gullability and venality of humankind, and so much more. There are some truly joyous moments and characters -- the wedding banquet followed by the Christmas eve celebration was marvelous, Sam Weller (Veller) and his hysterical father, and of course Mr. Pickwick himself. Stick with the early chapters and you'll be well-rewarded. If you could sum up The Pickwick Papers in three words, what would they be? Dickens' marvelous stream of inventive genius. 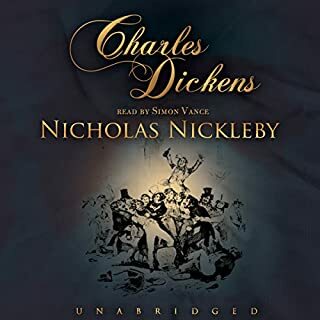 I have listened to another audible version of Pickwick Papers--in addition to reading it when I was young. But David Timson's performance is simply incomparable. I am thankful to have it, and look forward to listening to it again. Yes--but it would require me to go without sleep for several days. I don't normally write reviews, but I was so shocked by the first review to be posted that I felt I had to respond. To condemn Charles Dickens on the charges of racism and sexism displays a sad failure to understand the purpose of great literature, which is to open our minds to the full richness of life, and certainly not to re-enforce our current notions of political correctness. 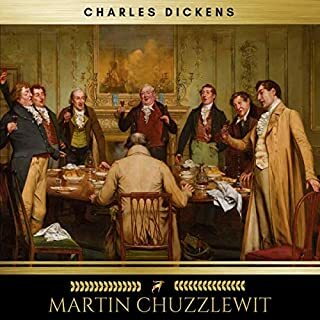 Few books display the richness of life more radiantly than The Pickwick Papers and I urge anyone who wants to enjoy a romp through early nineteenth England to download David Timson's enthralling version of Dickens first masterpiece. It is cheaper than a trip to England, and a lot more fun. 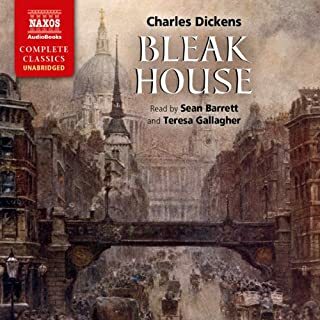 This of all Dickens' novels is perfectly suited to the audiobook format. With its picaresque, episodic style, it can be consumed in reasonably-sized bites without fear of losing the thread of a complicated plot. Dickens' framing device of an editor presenting a series of recollections by Pickwick club members, with occasional editorial interpolations, is abandoned fairly early in favour of a straight narrative style, to this listener's mild relief. David Timson strikes the perfect light comic tone for the narrator and creates the huge gallery of characters with unfailing invention and variety. Woven into the narrative of the main characters are tales told by incidental raconteurs from all walks of Victorian life - lawyers, actors, vicars, travelling adventurers, and landed gentry. The language is full of Victorian delights - characters asking each other to "Have the goodness to ...", endlessly fussing about what is "respectable", calling each other "My dear sir...", and all the while getting through snuff by the boxful, particularly my favourite, the diminutive lawyer Mr Perker. Timson's greatest comic heights come in the arguments between Sam Weller and his irascible father, with their idiosyncratic dialects that must read very oddly on the page but sparkle with humour in Timson's sure hands. Thirty-two hours have never passed so pleasantly. The wonderfully realized Dickensian characters. He depicted each character distinctly. I loved it for its sympathetic view of human foibles. I have listened twice and will listen again in the future. This is a feel good book for when you want something that is intelligent and well written, but not dark and sad. Where does The Pickwick Papers rank among all the audiobooks you’ve listened to so far? Fabulous stories and so beautifully read. One of Dickens very best. Could not choose, he was the best reader I have heard. All the characters came to life. i could not wait to go to the gym or ride my bike so I could get back to hear him. It was just like listening to a play. I will look for more books read by David Timson, i wrote his name down on my notes to help me remember when I was halfway thru this reading. The narrator, David Timson, is a master. David Timson's narration lets Dickens takes you straight to the nineteenth century and there you stay. This is a wonderful introduction to Dickens. It's sort of a collection of separate stories, each very funny and detailed. They tie together wonderfully through the character of Pickwick. I really loved this book and the narration was excellent. 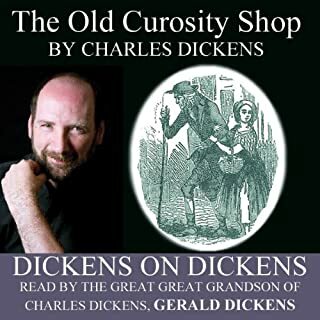 Dickens is one of my favourite authors and is certainly very enjoyable to hear read aloud. Such brilliant characters and so funny! Lots of laugh out loud moments, (which can cause strange looks when you are walking along outside listening on earphones!) This is even more brilliant when you consider it was a first novel by a very young Dickens in his 20s. The narration is fantastic. It is obvious that David Timpson knows and enjoys the book, and maybe even loves it as much as I do. This is an excellent reading. 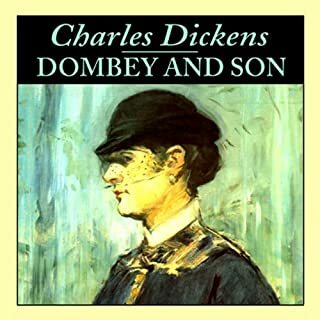 I was not familiar with the story but now it is one of my firm Dickens favourites. However (and isn't there always an however?) 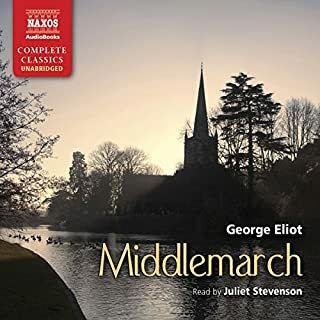 as good as David Timson is at reading it and bringing the characters beautifully to life, the accents of the characters in Bury St Edmunds and Ipswich is the usual "mummerset". Please, when narrators are preparing to read, can they not at least listen to a genuine accent? East Anglians speak with flat vowels and no rolled Rs. Dickens! What a master. So much to enjoy here and the reading is perfection with such a range of character and voices. The Pickwick Papers have some of the richest prose and most tangential narratives of any of Dickens' work. As a consequence the stories have been neglected by Film makers who seek the simpler character and story arcs of 'Great Expectations' and the like. 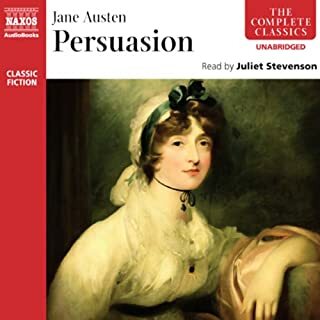 This audiobook is an excellent evocation of the novel in it's full charming complexity. Even more than his other novels this book was designed for serialization and so the audio is great for dipping in and out of. This was one of Dicken's earliest publications, originally serialised for a sporting magazine. Personally I prefer his earlier works as they are more cheerful, and the Pickwick Papers is no exception. Wonderful characters include big hearted and eternally adventurous Mr Pickwick, his faithful sharp-witted servant Sam Weller and Mr Winkle, ineptly aspiring sportsman not averse to a white lie or two. 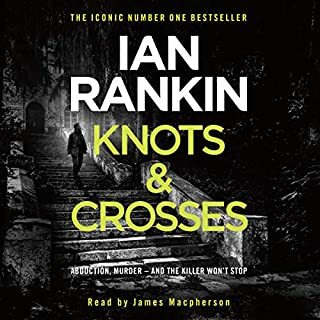 The large cast of characters can be confusing in book form, but in audio format with a fabulous reader like David Timson you can simply sit back and enjoy the ride. Very entertaining. 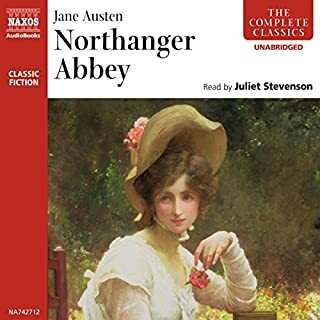 Read this first as an undergraduate in 1970s and recalled its charm when joining the Audible community recently. Seemed a perfect book to listen to a ill-health has made reading texts more demanding. 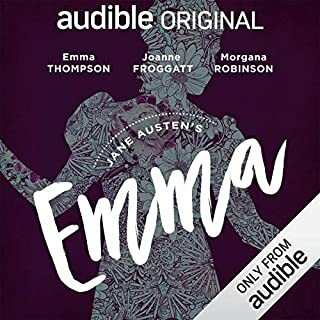 I have enjoyed the wonderful Dickensian narrative gifts in audio. The medium is so well suited to oral delivery. This narration enlivened the plot and delivered believable characterisation. I was engaged throughout, on otherwise sleepless nights..
A great story told in a way that brings out every nuance of every character. Mr P, himself. Admired and respected by everyone, in reality a bumbling but likeable gentleman. There are so many different characters but David Timson finds a distinctive voice for so many of them. I've listened to a few different versions of 'The Pickwick Papers' over the years, and I absolutely adore the book. 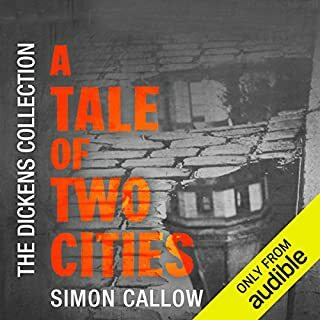 Dickens includes a huge range of wonderful characters, and in this audiobook David Timson has done a truly astounding job of bringing them all to life. It's a lengthy book (it is, after all, Dickens!) but the time flies by as you listen. There are a few audiobook versions out there, but in my personal opinion David Timson's narration is far and away the best. I loved the book. An incredible rendition of the great story. It was a shame that it ended. Brilliant.